On November 3rd, 2018, The New York Times award-winning journalist Vivian Marino, renowned columnist and senior editor for Business, Finance and Real Estate, requested an interview with Mahanakorn Partners Group Chairman Mr. Luca Bernardinetti on opportunities for property investment in Thailand. In response to a New York Times query concerning restrictions on foreign ownership of real estate in Thailand, Mr. Bernardinetti replied that foreign individuals are not permitted to own land in Thailand. However, under Thai law, foreign buyers can own buildings, including condos, but not land in their own name. A common arrangement is for buyers to purchase a home in conjunction with a lease for the land. Usually the lease is for a period of 30 years with options for two 30-year extensions. In the case of condominiums, foreign ownership is limited to 49% of a building’s total floor space. Another option for foreign buyers is to set up a private limited company with mixed Thai and foreign ownership – the foreign ownership being 49% or less, as private limited companies may hold land in Thailand. This also applies to wholly foreign-owned companies, as well as to Thai limited companies in which foreign ownership does not exceed 49% of the share capital. 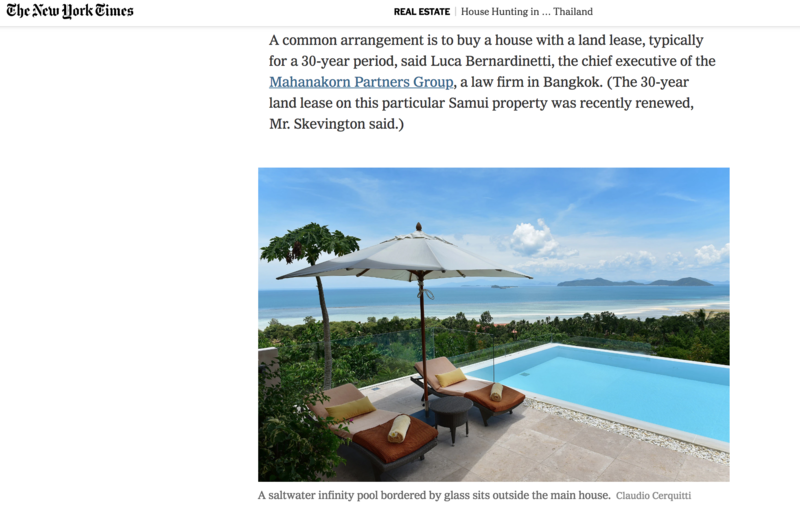 The New York Times journalist also enquired whether there are many foreigners buying property in Thailand and from which countries are they mainly from. Mahanakorn Partners, with over two decades, experience in property investments, confirmed that foreign investment is an increasing trend. Investors include westerners, mainly from the United States of America and Europe, as well as investors from Asia-Pacific, mainly from China, Japan and Australia. Many foreign buyers are interested in condominium buildings. There is also a preference for single-story homes with contemporary, outdoor swimming pools, in popular tourist and resort areas such as Bangkok, Chiang Mai, Phuket and Pattaya. Hiring an experienced lawyer is a necessary step, because a lawyer helps prepare the necessary documents, read, review and analyze the contract, and contact the Land Department. A proficient Lawyer would also perform due diligence checks on the property to ensure that it is not encumbered by liens. Given that the Land Department checks all of the information and history carefully, a lawyer is essential in facilitating the process. Furthermore, lawyers help buyers prepare several important documents. They also create power of attorney and calculate the various taxes and other fees associated with purchasing a home. Moreover, lawyers review contracts and protect the interests of their clients in buying property. – When a condominium is purchased, the seller creates the agreement. – The buyer pays a non-refundable deposit, as determined by the agreement, to reserve the unit. – The buyer pays a down-payment as determined by the agreement. In the case of a condominium project still under construction, the buyer may make the down-payment in installments for the duration of the construction period. – On the date of transfer, the buyer pays the total, outstanding amount. – The proportion of the transfer fee paid by the buyer and the seller is determined by the agreement. In some cases, especially in the case of a condominium under development, the seller may be willing to pay the entire transfer fee. – The seller transfers ownership to the buyer at the local Land Department office. Lawyers protect a buyer’s rights and interests throughout the purchasing process. Normally, transferring ownership takes a full day, but a lawyer can expedite the process. Ms. Marino was interested in knowing whether buyers must be present at the closing or if they can grant power of attorney to their lawyers. Mr. Bernardinetti confirmed that, because a buyer can authorize their lawyer to take ownership in their place, buyers are not required to be present. Purchase transactions are conducted in Thai baht. In most cases, a foreign buyer’s funds must come from overseas. If the buyer has a work permit for Thailand, they may use locally earned funds. Closing costs are subject to a number of variables, including whether the seller is a natural person or a legal person (i.e. the project developer), how long the property was owned by the previous owner, the Land Department’s assessment of the property, and the agreement between the seller and the buyer. Generally, the closing costs are, in total, approximately 6%. In addition, buyers must pay a returnable deposit to the relevant water and electric authorities for use of the respective meters. The New York Times concluded their interview with the Mahanakorn Partners Group by asking if the Thai real estate market is generally healthy. Mr. Bernardinetti answered that the evidence suggests that the market is quite healthy and holds many opportunities for investment in Thailand. Read an excerpt of the NYT interview to MPG here.